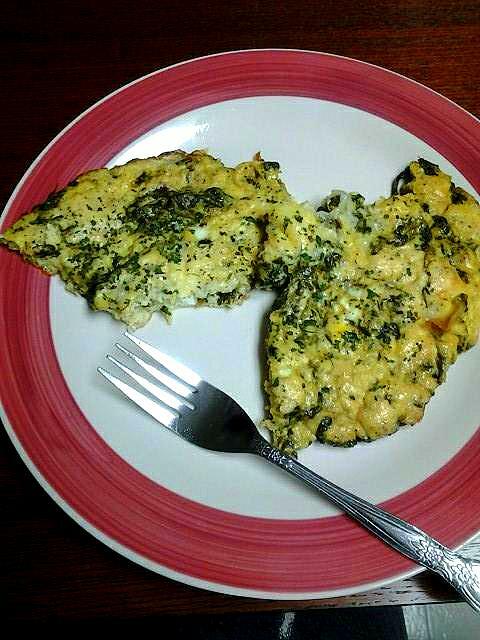 About two years ago, I fell in love with the frittata. I never ate one at a restaurant or anything. The adoration began from that "I Can't Believe It's Not Butter" commercial with Lisa Vanderpump. I thought that frittata looked so good. Then I began seeing frittatas pop up all over the place on TV and in magazines. Then I decided that it was time to try my hand at making one based from an Alton Brown recipe. I made my first one in 2013 and it is my go-to quickie meal. I make them different ways now; veggie, meaty, and a combination of both. My favorite frittatas are made with dark leafy greens like spinach and kale. In fact, these were my starter frittatas and are still a hit at home and with guests. In a medium-sized bowl, mix together eggs, Parmesan, pepper, salt, garlic powder, dried rosemary, 3 dashes of Tabasco, and 1 teaspoon of parsley. Heat an oven-safe pan on medium-high heat. Add butter and melt. Guide butter to all sides of pan as it melts to coat the pan. Add kale and onions. Sauté for 3 to 4 minutes, sauté longer or shorter depending on how tender you like your kale. Pour egg mixture into pan and stir with rubber or wooden spatula (both have worked well for me). Cook between 4 to 5 minutes. By that time, the eggs should set at the bottom and the edges. Turn off heat, sprinkle parsley and mozzarella on top. Place pan in the oven. Broil for 3 to 4 minutes. Promptly remove from oven. Slide your spatula around the edges of the frittata to loosen it. Slide the frittata onto a serving plate and cut into pie-sized portions. Serve while still warm. Thank you Alton Brown for providing an easy recipe for me to make my first frittata (the main image). At heart, each version I make is based off that initial one.